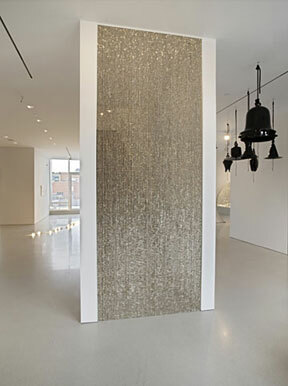 “Floating a Boulder” brings to mind other, less dreamlike magical acts, such as Gonzalez-Torres’ minimalist-inspired use of commonplace, industrially manufactured objects—office clocks, stacks of offset prints, candies, strings of lights—which he deployed in ways that far exceed the meanings and functions of such objects, eliciting unexpectedly emotional responses in susceptible viewers. Thus the uncanny drama of paired, battery-operated office clocks (“Untitled” [Perfect Lovers], 1987-90); or the artist’s conception of the stacks and candy spills, which gradually disappear as viewers carry off their constituent parts, but which the artist conceived so that their owners can replenish them if they wish. In this way, such works address the nonnegotiable fact of life’s major and minor contingencies while also imagining the possibility of renewal. Hodges, too, has performed magically affecting acts: with flimsy little paper diner napkins, artificial flowers, biker jackets, used 501’s, soiled jockey shorts, brogues, camouflage, chain link, etc., he has produced evanescent works of art that evoke loss while providing the limited, yet not insignificant, consolation of pleasurably challenging aesthetic engagement. Even if one did not know (as many do) that Hodges and Gonzalez-Torres were intimate friends, viewers could easily discern that fact while coming upon more and less closely related works by each artist. That impression of the profound connection between them intensified as visitors meandered from one part of FLAG’s space to another. 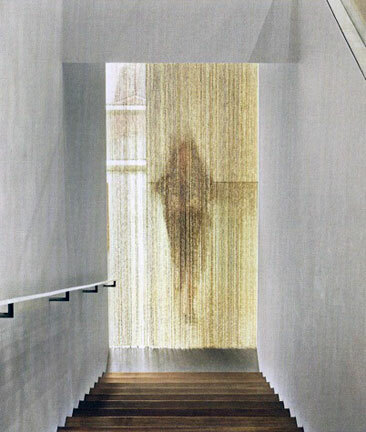 Passing through the plastic beaded curtain (Gonzalez-Torres’ “Untitled” [Golden], 1993) that formed a glittering, fluid threshold across the entrance to the staircase connecting the ninth- and tenth-floor spaces, they discovered one of Hodges’ delicate curtains of artificial flowers screening the small landing to the left at the top of the stairs, where it hung near two works by Gonzalez-Torres. How remarkable it was to see such works the way Hodges situated them to foster such generative interplay. Hodges may have done his friend a favor of sorts by revealing Gonzalez-Torres’ profound commitment to fathoming and giving poetic shape to the public as well as private contents of individual consciousness. This juxtaposition of seemingly disparate works by each artist provided one of many thoughtful groupings of works in an installation that elsewhere could be disarmingly forthright in its allusions to the friendship and aesthetic sensibility that these two artists shared. Perhaps nowhere was that forthrightness more evident than in the pairing of Gonzalez-Torres’ “Untitled” (Go-Go Dancing Platform), 1991, with four of Hodges’ large-scale mirror-mosaic panels (2005–09), each with titles that incorporate the word movements. Like flattened-out disco balls, these panels, each with one rounded edge, dispersed prismatic sprays of light onto the walls next to where they hung. Heralding the retrospective, memorializing aspect of this gallery’s installation at its threshold, Hodges hung Gonzalez-Torres’ “Untitled,” 1991, the silk-screen print that the Public Art Fund published and offered for sale to help defray the cost of realizing the artist’s first billboard design—the monumental black-and-white dateline piece that the artist conceived to mark the twentieth anniversary of the Stonewall riots with a randomly organized selection of names, events, and dates, all of which relate to gay history, culture, and politics, which sign painter Kevin O’Connell hand-painted in two lines of white letters and numbers near the bottom of the otherwise black expanse.5 Appearing on a privately owned billboard above Sheridan Square (aka Stonewall Place) in a public setting traversed by such private interests less than one block from the site of the formerly Mafia-run Stonewall Inn, this public work employed a number of methods to expose the brittle permeability of the boundary between “public” and “private,” which gay men and lesbians have been positioned so well by church and state to mistrust.6 Perhaps to undermine any singular reading of the nearby gallery’s contents (i.e., as “a memorial to the pre-AIDS disco era”), Hodges also inserted a small, menacing presence in the space—an unrelentingly single-minded small black photostat, “Untitled,” 1988, which packs a fearsome wallop despite its diminutive size. Its white dateline lists only the names and dates of lethal armaments that figure among the few remaining products of American industrial ingenuity; “B-2 Stealth Bomber 1982 V-22 Osprey Antisub plane 1983 / A-6 Intruder Fighter 1984 Aquila Drone (Remote-piloted) 1987…” etc. In the corridor outside that gallery, Hodges maintained the somewhat gloomy tone by installing his own lugubrious The Bells/Black, 2007, which shares in the interactivity of the works by his friend with removable and/or adjustable parts by tempting viewers to pull on the nylon bell cords to produce nonsonorous gongs. On the long west wall opposite the entrance to this gallery, Hodges hung Gonzalez-Torres’ color photograph of flowers, “Untitled” (Alice B. Toklas’ and Gertrude Stein’s Grave, Paris), 1992, only a few feet away from his own intricately incised photograph of a tree shot against a sunny yet chilly-looking sky (London II [pink and blue], 2006–09). Emitting its own silvery light, this work rhymed visually with the self-portrait’s reflective paint. 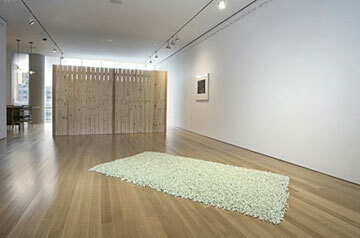 On the floor in front of these works, Hodges placed a rectangular carpet of green cellophane–wrapped candies (Gonzalez-Torres’“Untitled” [Rossmore II], 1991). This singularly verdant candy piece, presented here in two parts, is named for the street in Los Angeles where, in 1991, Gonzalez-Torres stayed with his lover Ross Laycock and Harry, their black Labrador retriever, in a furnished one-bedroom flat at the funky Ravenswood Apartments during Gonzalez-Torres’ one-semester teaching job at CalArts.8Hodges installed a mound of the green candies in one corner of the adjacent (“dining room”) space, where he also installed one of his own delicate accumulations of drawings on paper diner napkins (A Diary of Flowers [Just Blue], 1993). On the gallery’s north-facing wall, Hodges installed Gonzalez-Torres’ “Untitled” (19 Days of Bloodwork—Steady Decline), 1994, one of a number of deeply affecting variations on Agnes Martin’s graphite grids. 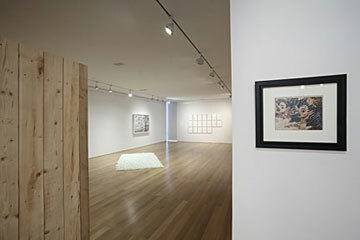 Near the south-facing windows, Hodges provided visitors with a space to retreat and reflect, or anyway to relax in comfort with a modicum of privacy, by installing his own A Good Fence, 2008. 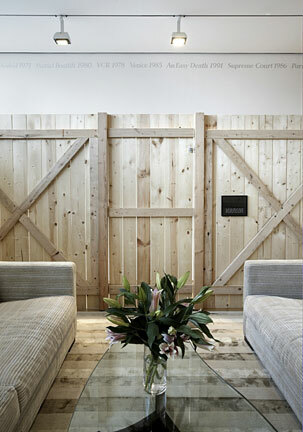 This pine enclosure, replete with hinged gate, was large enough to enclose a pair of couches (part of FLAG’s own furnishings) that faced each other (north/south) from opposite sides of a coffee table on which Hodges placed a vase of stargazer lilies that were almost as fragrant as the pine enclosure itself. Hodges calibrated the installation so that anyone seated on one of the couches could see part of the self-portrait and part of the photograph of Stein’s and Toklas’ flower-planted gravesite over the top of the fence. 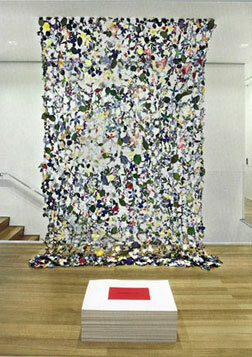 But viewers did not need to look even that far to find one of Gonzalez-Torres’ works. Inside the enclosure, Hodges hung a small 1988 photostat with a dateline that begins “ New Life Forms Patents 1987 Ollie 1986 / Anti-Frost Bacteria 1987 MTV 1983…,” its historical cues again bringing public issues to bear on a private situation. One need only consult another catalogue of Hodges’ works (say, the handsome one from the Frances Young Tang Teaching Museum at Skidmore College) to get a sense of the breadth of his output over the years, as well as of the editorial effort that he must have expended to single out a suitable selection of his own works to correspond with his selection of works by Gonzalez-Torres. These he cogently mobilized not only in FLAG’s space but also on two billboards in Manhattan and two each in Queens and the Bronx. As of this writing, New Yorkers have the opportunity once again to look up and see the uncaptioned image of a queen-size bed with rumpled bedclothes and two pillows, each indented with the impression of the head of the person who had lain there. That well-known and much-loved billboard has lost none of its haunting luster since it was last seen in New York nearly a decade ago.9 In such ways, Floating a Boulder provided an opportunity for viewers to see an intimate selection of important works by two remarkable artists in dialogue. The project provided Hodges with an opportunity as well to revisit and extend the dialogue he maintained with Felix during his lifetime; a chance to return to his powerful sense of connection to the cherished friend whom he lost. 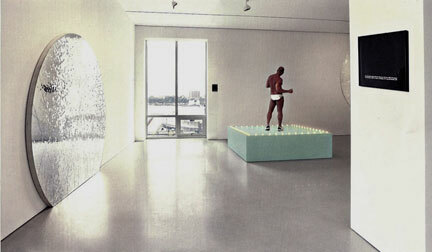 Inasmuch as this dialogue now occurs across the threshold that separates here from there, now from then, life from death, it recalls and enacts one of the more important tropes that Felix returned to more than once: in stacks that bear the parenthetical title Passport, and in the paired mirror installation “Untitled” (Orpheus, Twice), 1991. To this observer, no less magical than floating boulders in the sky. 1 “when working on a title for the exhibition i went through the same process as i always go through when looking for the words to attach to work. with ‘floating a boulder’ i felt extra pressure to ‘get it right!’ since the words would be associated with both felix’s and my work. once many years ago felix complimented me on my titles saying, ‘jimmy, you and roni have the best titles.’ it meant a lot to me but also added to the anxiety about giving this project a meaningful name that would live up to his expectations, (a bar he had set high for me many years ago). i had to find the words that could contain both his and my respective practices and as a matter of fact it was by focusing on each of our practices that i came to these words. on one of those early morning realizations after days and maybe weeks of contemplation, frustration, obsessing on the subject, i awoke with those words on my mind … the elusive image or condition that they conjured in me felt perfect… obscure and yet specific and weighted… something alluding to magic and overcoming the impossible, bringing to mind intentions, belief, power and awe….” Jim Hodges, e-mail to the author (December 4, 2009). 3 Andrea Rosen and Jim Hodges both maintain that Gonzalez-Torres understood the German statement in two ways, the second of which would be, “We do not remember ourselves.” But erinnern is a reflexive verb, and a German speaker would never use it to mean what Jim and Felix evidently thought that it also meant. 4 See: Miwon Kwon, “The Becoming of a Work of Art: FGT and a Possibility of Renewal, a Chance to Share, a Fragile Truce,” in Julie Ault, 281. 5 During a meeting at FLAG just prior to the opening of his installation, Hodges introduced me to Kevin O’Connell, who was in the process of painting Gonzalez-Torres’ self-portrait in the large tenth-floor gallery. They both also informed me, to my great surprise, that Kevin had hand-painted the white dateline on the billboard over Sheridan Square. 7 Hodges has noted that he had also proposed adding “Obama 2008,” but that the Art Institute preferred to retain its own “Election Night Grant Park 2008.” In retrospect, this seems a wise choice, given the Obama administration’s mismanagement of the process of reforming American health care. 8 “Harry the Dog 1983” was the fourth item in the self-portrait’s first iteration (at the Brooklyn Museum, 1989), and has since been deleted. Soon after Felix and Ross left the Ravenswood, I moved into the same apartment (also for one semester’s teaching at CalArts). There I found that a band of black dog’s hair had accumulated where the apartment’s beige wall-to-wall-carpeted floors met the beige-painted walls. When I first saw the Rossmore-related candy piece, it was in the form of a long, narrow, wall-hugging strip of the green cellophane–wrapped candies, and it reminded me not only of the similarly narrow strip of grass that lines Rossmore Avenue’s sidewalks, but also of the strip of black dog’s hair lining the walls of the apartment where we all had stayed. 9 In fact, to some the billboard now looks even better than it originally did. 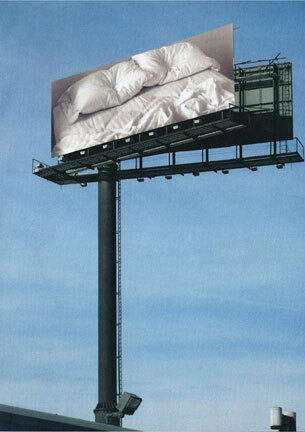 As Felix often did, he foresaw and embraced the fact that billboards would change—not only in terms of their imagery at any given time but also in terms of contemporary techniques of display. The medium listed for the billboards in the artist’s Catalogue Raisonné always laconically states “billboard.” This left such works open to historical contingencies and kept the billboards alive, not unlike the portraits. Between 1992, when it first appeared as the Museum of Modern Art’s Project 34, and 2009, those techniques did change. The billboard is no longer a gigantically enlarged half-tone blow-up of a black-and-white photograph, but a high-resolution print on vinyl. It glows now as it never quite did before.